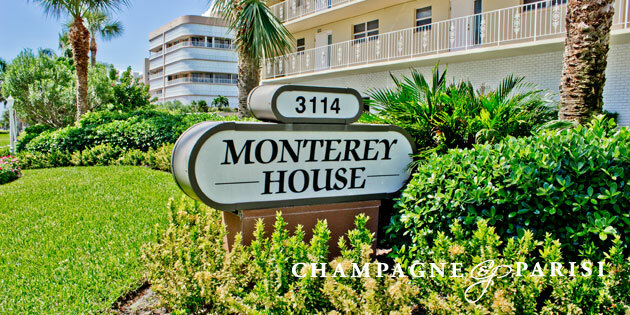 Monterey House is a coastal luxury condominium community situated near the Intracoastal and Atlantic Ocean in Highland Beach, Florida. Monterey House boasts 79 upscale residences in an 8 story tall building that is sure to keep its residents feeling like they are on vacation every day. From each residence’s private balcony breathtaking views of the sparkling water, lush greenery, and tropical paradise can be seen. Each unit also features spacious kitchens, walk-in closets, and a split-bedroom layout. The Monterey House condo building offers residents the 5-star amenities that are often found in resorts. Things like a gorgeous swimming pool with ocean view, tennis courts, shuffleboard courts, private boat dock space, and easy beach access are just some of amenities provided for residents. Residents can also enjoy a large private clubhouse, with its own granite countertops, lounging area, kitchen, flat screen TV, and entertainment room all just within walking distance of Monterey House. Beyond the building residents are just a very short drive away from a bustling city, comprised of exquisite shops, fine dining, and fabulous entertainment. You’ll never be far from your destination with many major highways and two international airports close by. Enjoy the perks of this resort-style building while living in paradise by becoming a resident of Monterey House in Highland Beach.